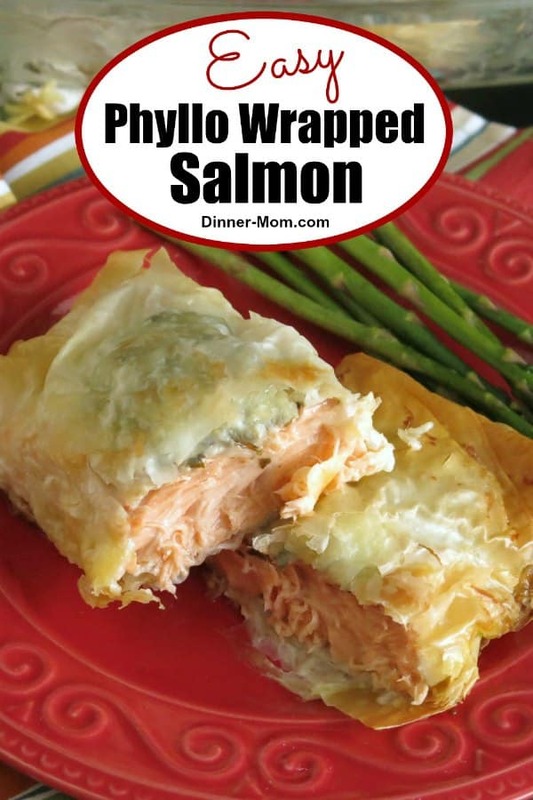 Phyllo Wrapped Salmon is the elegant dinner entree that everyone will talk about and it takes just minutes to prepare. Phyllo dough takes an ordinary dish to an extraordinary one, in my humble opinion. It’s fancy, but does add too many extra calories and (egg, dairy, and soy) is allergy friendly. And, who can resist salmon en croute?! At first, it may seem daunting to work with this delicate pastry, which also goes by filo dough. Alas, it is also very forgiving in the final presentation. Salmon topped with pesto and cheese and wrapped in phyllo perfectly makes my point and so does Phyllo Wrapped Asparagus. This entree was always popular at our store, perhaps because customers got to play with dough and ended up serving a beautiful dish no matter how much the phyllo dough cracked or tore during the assembly process. If you are not a fan of salmon, just follow the recipe using chicken! Extra pesto? Check out this Healthy Pesto Chicken Recipe which can be made with salmon too! Completely defrost the phyllo dough according to the directions. Don’t rush it. If you unroll it too soon, it WILL crack apart. Make room in your refrigerator to temporarily hold a cookie sheet. Roll the dough out onto a cookie sheet. Cover the dough with plastic wrap and then a wet towel. When you are not using the dough, store it in the refrigerator. Don’t worry about cracks or tears. They will happen and your entree will still taste and look terrific! The box the dough comes in should have lots of handling tips too. With these rules in mind, let’s make phyllo-wrapped, pesto cheese salmon. First, gather and lay out all of the ingredients and measuring utensils. 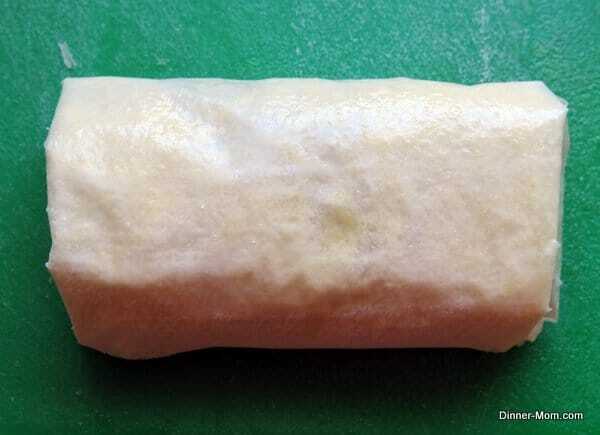 Remember to wait until you are ready to wrap and roll to pull out the filo dough. Note: This is a more or less recipe as in top with a little extra cheese if you’d like or use a little less pesto if desired. Take 1 sheet of phyllo dough and place it on a work surface. Sprinkle 1 Tablespoon of Parmesan cheese over it. Next, take a second sheet of phyllo dough and place it on top of the first one. If you are studying the pictures, then you may see an occasional crack. Sometimes I violate my cardinal rule and leave the dough out a little too long while taking pictures. It doesn’t change the outcome at all! 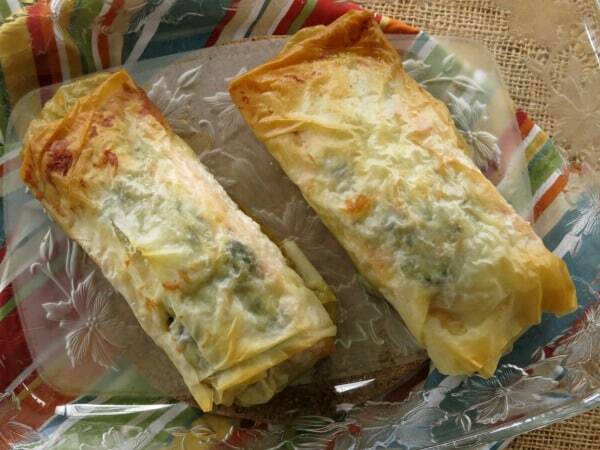 Place salmon on top of prepared phyllo dough sheets about 2 inches from the left side. Season with salt and pepper if desired. Top each piece of salmon with about 1 Tablespoon of pesto and 1/4 cup of Mozzarella cheese. I use a prepared pesto from a jar. But, there are so many great options out there, such as cilantro pesto, or spinach pesto from Weelicious.com. 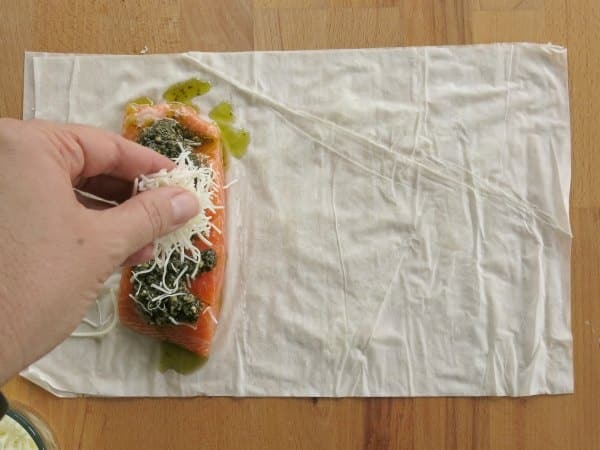 Fold the long sides over the salmon and then roll it up jelly style so that the pesto and cheese end up on top. 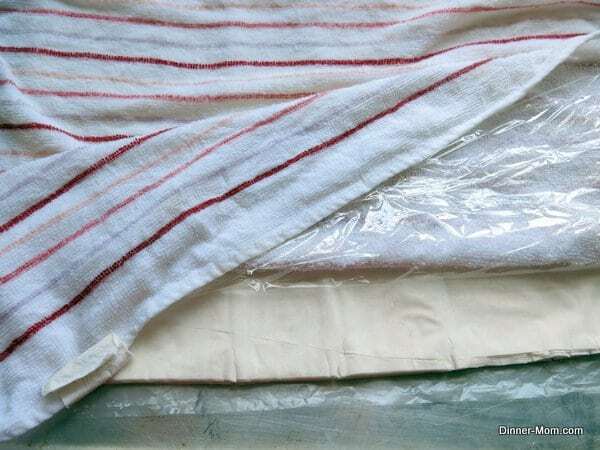 If necessary, just fold the excess amount underneath. Spray a little cooking spray on top or brush it with butter. Any cracks that were in the edges of the phyllo dough won’t show! Now, repeat, repeat and repeat (and possibly repeat and repeat) for the number of servings phyllo salmon you needed. 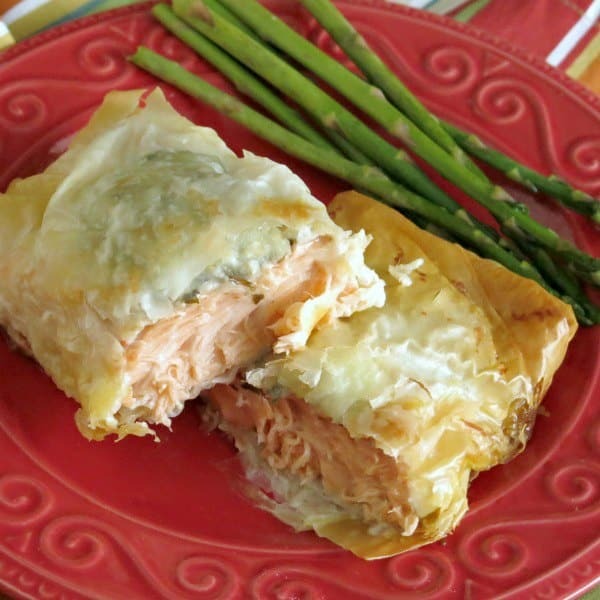 Bake phyllo wrapped salmon in a 350ºF oven for about 20-25 minutes. The cooking time really depends upon the thickness of the fish and that can vary widely which is why I always rely on my trusty cooking thermometer. Fish should reach a temperature of 145ºF. If the top is getting too brown, tent it with some aluminum foil. Did I mention the same recipe can be used on chicken too? To make ahead and freeze phyllo wrapped salmon, assemble it but do not cook. Place packets in a baking dish or aluminum tin and cover and freeze right away. Store for up to 2 months for best quality. Defrost and cook according to instructions. Please rate this recipe and tag @DinnerMom and #DinnerMom on social media. We love to see what you are cooking up! 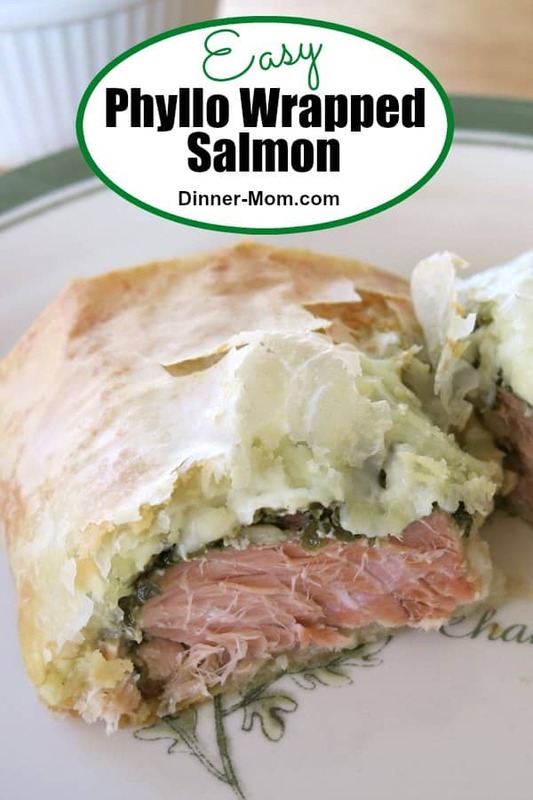 Phyllo-wrapped salmon is topped with pesto and Mozzarella cheese for an easy and very elegant dish. Place 1 sheet of phyllo dough on a work surface. 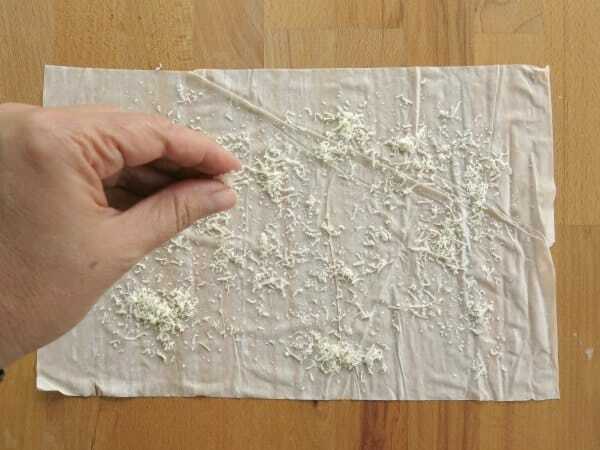 Sprinkle 1 Tablespoon Parmesan cheese over the phyllo dough. Place a second sheet of phyllo dough over the first piece. Place one salmon fillet about 2 inches from the left-hand side of the prepared phyllo dough sheets. Top with 1 Tablespoon pesto and 1/4 cup of mozzarella cheese. 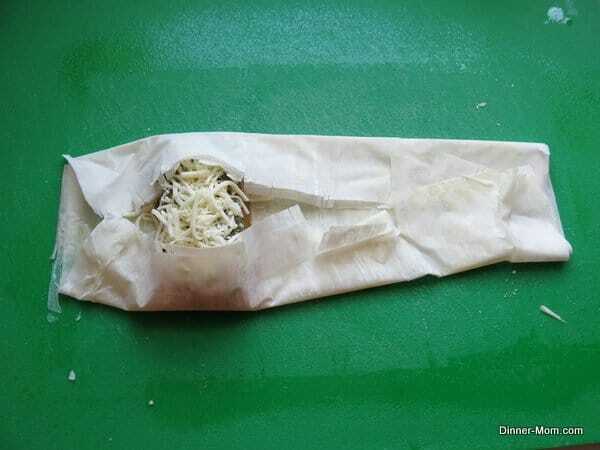 Fold the long sides up over the salmon and then roll up so that the pesto and cheese are on the top (not the bottom.) Tuck extra phyllo dough underneath. Lightly spray the top of the wrap with cooking spray or brush with melted butter. Repeat for each salmon fillet. Bake uncovered for 20 to 25 minutes or until the internal temperature reaches 145 degrees. If the phyllo doughs begins to brown too much, then tent it with aluminum foil. Dish can also be made with chicken; Cook to a temperature of 170 degrees (about 30 minutes.) This entree may be made ahead and frozen. Make dish and place in aluminum or other baking tin (freeze right away so the dough does not become soggy from the pesto.) Cover with foil and plastic wrap. Store for up to two months in the freezer. I just came across your website and love it. I plan to make the lemon Basa. Have copied some of your other recipes. They look so easy and delicious. I’m so glad you found us! I hope you enjoy them! I came across your recipe for the Phyllo-wrapped Salmon. I bought all the ingredients and plan on making it tonight for my sister and brother-in-law. Hope it comes out OK. Will let you know. Looking forward to your feedback!!! Wow! The salmon was absolutely delicious!! I rated this a 5 but if there were more stars I would rare it higher. I followed your recipe to the tee. I worked with phyllo dough a long time ago. It is not easy. After the first wrap it became a little easier. My guests raved about it and said I should make it again. Thank You for a fantastic recipe and I am looking forward to making more. Wohoo!!! You made my day. Thanks for sharing! Ok, I have made a lot of meals for my husband and family over our 36 1/2 years, but I have never received the races U did when I presented this dish. I looked over a few different sites and recipes, but settled for the ease and simple ingredients of this great recipe. The only thing I had suggest was the exchange of WALNUTS in pesto sauce in place of pine nuts, and adding a little more lemon upon serving to bring out the flavors. Thank you I will try this again, with my whole family, when salmon season is upon us, and we have more to work with. The ease and cleanup and even prep-ahead, will make my dinner party much more stress free! Thank you!! I’m thrilled that you enjoyed it! Thanks for your tips!